Description: This is a feather-like species which grows in clusters, often on the brown seaweed Halidrys siliquosa but also on rock surfaces in shallow water. The central stem bears alternating unbranched side branches with polyps all facing upwards. Each feeding polyp is surrounded by three defensive polyps. The reproductive polyps are enclosed in a basket-like corbula, which replaces a normal side branch. The colony is brown in colour. Typically 3-4 cm in height by 1 cm wide. Habitat: Typically associated with the brown seaweed Halidrys siliquosa, but also found on rocks in exposed or very exposed conditions in shallow water, to about 10 metres. It is the only Aglaophenia likely to be found in rock pools or on the shore. 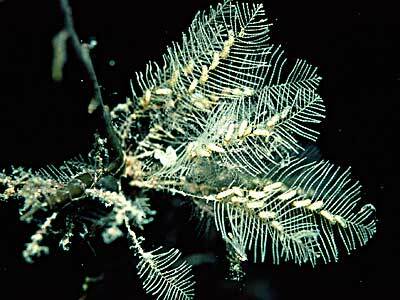 Ecology: The nudibranch Doto koenneckeri is specifically associated with this hydroid. Occasionally Eubranchus farrani will also feed on it. Distribution: A common species in shallow water and occasionally found on the lower shore, all round the British Isles. Similar Species: All Aglaophenia species are similar to each other, as is Gymnangium montagui. Corbulae with all leaves turned in. Picton, B.E. & Morrow, C.C. (2016). Aglaophenia pluma (Linnaeus, 1758). [In] Encyclopedia of Marine Life of Britain and Ireland.